Mr. Ya'qoub holds Bachelor’s degree in Mechanical Engineering from the Sultan Qaboos University. Mr. Al Harthi has been associated with power plant operations and management in various power plants of ENGIE for over 14 years. He was appointed as CEO of Al Kamil Power Company SAOG in 2015. Prior to that he was the General Manager of Al Kamil Construction and Services LLC from early 2014. He has also worked in Rusail Power Station and Sohar 1 Power and Water Plant as Operations Manager for several years. Mr. Nakamoto holds Bachelor’s Degree in Business Administration from Yokohama National University Mr. Nakamoto has more than 20 years of experience in the energy infrastructure industry. Since joining Sojitz in 1994, he has been involved in development of various infrastructure projects in Japan and overseas. From 2006 till 2010, he was the Chief Financial Officer in Phu My 3 IPP project (715 MW, gas fired) which has been operating since 2004 in southern part of Vietnam and from 2010 till 2014 he was the Chief Financial Officer in Al Batinah Power Company and back in the same position from 2018. 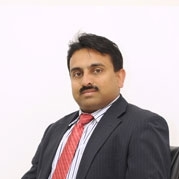 Mr. Kumar joined Al Batinah Power in March 2011. He has been working in Oman for over seven years. He started at Kharafi National as Country Manager and then joined W.J Towell, where he worked for six years as Manager – Projects, handling the O&M of power and water related projects. Before coming to Oman, Mr. Kumar worked with Reliance Energy in India as Deputy Manager - Operations. He started his career with Chambal Fertilizers - India in 1995. Over these last 19 years, Mr. Kumar has gained multi-functional experience in the field of business development, engineering, operations and maintenance in power, desalination and utilities in India and the Middle East.